The Republican establishment and even some conservatives are already starting to count the Montana Senate seat in the “R” column after charges of plagiarism in his Army War College thesis forced incumbent appointed Democratic Senator John Walsh to end his election bid. The Democrats apparently had to scramble to find someone to accept the nomination after Walsh dropped out of the race on Aug. 7 and ended up choosing, Amanda Curtis, a high school math teacher and one-term state legislator as their nominee for what The New York Times calls the “fiercely contested” Senate seat. The Republican nominee, Steve Daines, is a good man and an excellent candidate, and the political class of both parties sees almost insurmountable odds against Curtis, but we’re not so sure Curtis is going to be the pushover that Republican insiders are claiming. The Montana Senate seat, that is now an open seat, has been in Democratic Party hands for a century and, as Real Clear Politics observed, former Senator Conrad Burns is the only Republican to be elected to successive terms to represent Montana in the U.S. Senate. Despite the fact that Montana has trended Republican in presidential voting, the state has a strong union-based populist voting tradition – witness the fact that the current Governor is a Democrat and that one of the state’s most popular political figures is former Democratic Governor Brian Schweitzer. Ms. Curtis for her part wasted no time in defining her underdog race in terms intended to appeal to populist-minded voters, casting the stakes of the election in stark economic terms, saying it was about “millionaires versus the middle class.” As the daughter of a union worker whose family sometimes relied on food stamps to buy groceries, Ms. Curtis said she knew what it meant to worry about bills and the price of gas, noted The New York Time’s Jack Healy. Republicans, especially those of the inside the Beltway political class, are inclined to assume that a majority of voters will automatically deduce that Obama owns the economy and that the failed “recovery” is all Obama’s fault. This is the same kind of thinking that led Mitt Romney to opine that 47% of the people would never vote for him and to assume that the way to lock-up the remaining 53% was to run on his resume, which was long on making money and short on connecting with the real life problems weighing on the minds of voters. 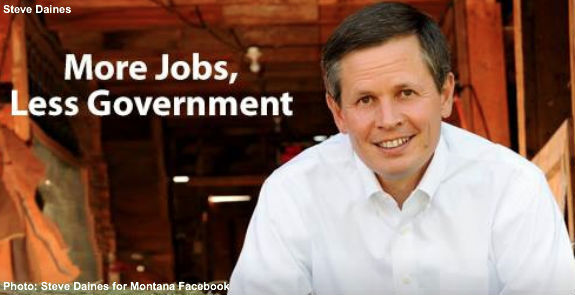 Steve Daines has a great record and a great resume, plus he has raised more than $4 million and has about $1.7 million on hand; that is a good place to start, but it reminds us an awful lot of the campaigns of Republicans, such as Rick Berg in North Dakota and Denny Rehberg in Montana, who started out with everything going for them and still managed to lose in 2012. In starting out on day one with a populist message Amanda Curtis has signaled she may be the underdog, but she will be no pushover. We hope Steve Daines wins, but he won’t do so if he plans on laying back and coasting to victory by running a “rope-a-dope” campaign as the candidate of the U.S. Chamber of Commerce, mouthing pabulum from the National Republican Senatorial Committee. The winning counter to Curtis’ populist message is that of limited government constitutional conservatism and we’re still waiting to hear it from Steve Daines. Submitted by zapox6 on Mon, 08/18/2014 - 13:26. Obama and his sly team have managed to generate such a sympathy for the inept president and his friends, that it is hard to criticize him or to challenge Dems on policy. They just whine "Republicans are so mean!" They make excuses like all toddlers do...and if you get too critical....the cry is......"I voted to raise taxes on the corrupt rich to help the poor." Just as in the 60's.....its "flower power....love, love LOVE." Congress is not willing to use its "Daddy" authority to rein Obama in and say firmly, "NO. You can't have what you want. It will hurt America. We the People disagree." The underdog card is now on the table in more than one Democrat race. Aggressive, red meat attitude may work with a few Libertarians who are still very small in number, but with the majority of voters who don't want a fight, "just shoot them" won't work. Tough political climate, no doubt about it.